Hello, I'm not a native english so I gonna try to do the best I can. I recently bought a 3D printer but when I slice with slic3r or skeinforge, repetier host crash, when I try to load a Gcode file, repetier host crash too, do you have an idea for fix it ? What is the crash reason shown? Do you have opengl 1.5 or higher running (shown in log) and enough free memory? I think have enough free memory. I didn't find the OpenGL's version but here is the crash report. Ok, just see it is the mac version. Do you have a gcode that causes this? It should be stored in your work directory. From crash log I see it crashed while updating a rectangle but then the missing debug informations make it impossible to see exact source. So I need an example causing the crash on load. If I understand, you need a gcode who is in the work directory ? But where is the work directory ? In host in files directory you have a entry to open finder in it. I meant files menu of course. Ok, thank you, here's the content of the folder. When I placed with visualization quality I found that Adaptive Volume causes a crash while the other 4 settings seem to work. Since filament visualization is very heavy operation you should select medium. Ty a lot, that work ! For me it works, but you need to select the object you want to center. What is the problem you have? Not selectable because no object is selected (boxed in blue lines)? 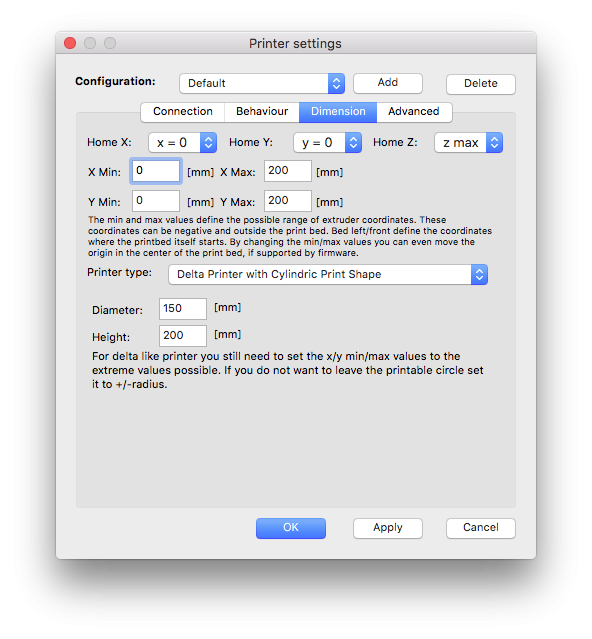 What is your settings in printer settings->dimensions then?